After a series of posts urging people to vote in the Whaley Bridge and Buxton Tesco stores, we were delighted to finally meet the store’s community representative, Bev Scott, and the local enabler, Elizabeth Edwards as they presented us with a huge cheque for £4,000 towards our digital radio upgrade project. The team came out top in the customer vote in the Bags of Help appeal during September and October. We are pleased to say the other two worthy causes walked away with £2,000 and £1,000 each. 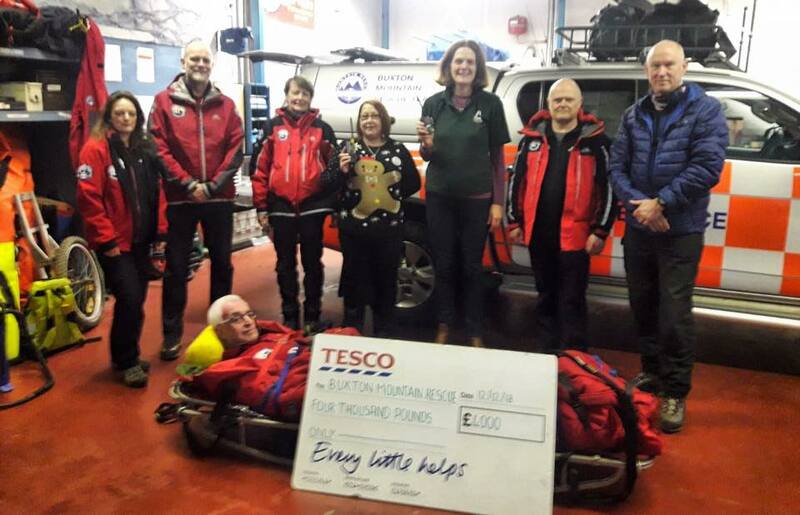 Buxton Mountain Rescue Team Leader, Neil Carruthers said “Mountain Rescue Team members are all unpaid volunteers who give their time and expertise to assist those in need in wild and remote places We rely entirely on public support and donations like this from the Tesco Bags of Help appeal. We can’t begin to thank Tesco’s and their customers from Whaley Bridge and Buxton and the surrounding areas for their amazing support; we were overwhelmed by the response. We would encourage other charities and worthy causes to find out more about the Bags of Help scheme and get their applications into the system.